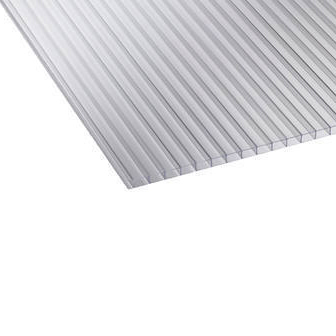 4mm Twinwall Corotherm is a light weight, impact resistant polycarbonate sheet, suitable for side cladding only, not suitable for roofing. It is guaranteed for 10 years. When installing Corotherm sheet it is important to allow a sufficient expansion gap at the top end of the sheet. When drilling fixing holes an expansion allowance of 3mm around all fixings is required. Do not fix or clamp sheets too tightly- leave room for thermal movement.